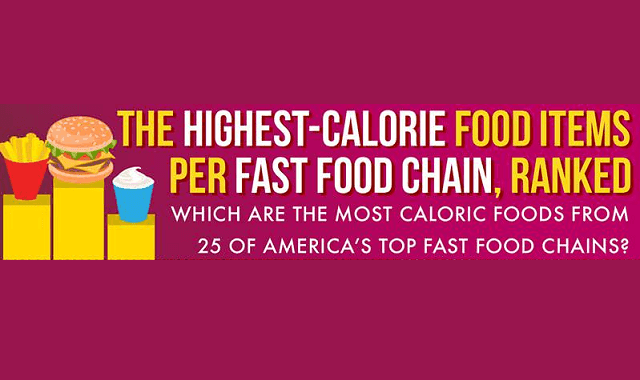 The Highest-Calorie Fast Food Items Ranked #Infographic ~ Visualistan '+g+"
We know fast food is bad for us, but what are the worst fast food items you could order? In this infographic, we’ve dug up the single most caloric foodstuff listed on each restaurant’s official menu. Boy, did it bring some surprises! For example, one might assume that the worst thing at Dunkin’ Donuts is a super large, super heavy, and super fattening doughnut, but alas! The worst thing at that restaurant is one of its frozen drinks! In fact, milkshakes rank as some of the worst single fast food items of several of the 25 top fast food chains we reviewed. After looking at restaurants from Sonic to Panera to Starbucks to Wendy’s, we’ve gathered some pro tips. Avoid those super-caloric and sweet milkshakes, as a general rule. Also, avoid breakfast at Arby’s, McDonald’s, Chick-fil-A, and Burger King; the breakfast platters are some of the worst things on those menus! While you shouldn’t exactly reach for the tall burgers at Hardee’s and Carl’s Jr., it’s the sweet and sticky stuff that will stick to your ribs the most. When it comes to the “eat this, not that” mentality, definitely don’t eat these!